Casa Aztlán members would like to extend an invitation to the public to help celebrate 43 years of service to the community on Saturday, Sept. 21st at the National Museum of Mexican Art, 1852 W. 19th St., from 6p.m., to 10:30p.m. Food and drinks will be provided as well as live music and an art auction. Donation is $50. 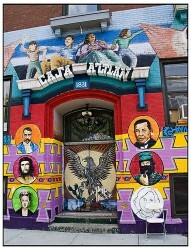 Funds raised will be used for the legal defense of Casa Aztlán in their fight to save the historic building that has housed the iconic institution for the past 43 years. In addition, the Quetzalcoaltl Award will be given to Lulu Martinez, heroin DREAMER, who was arrested while crossing the border to protest the lack of immigration reform. For more information, contact Casa Aztlán at 312-666-5509.